Education isn’t cheap, and keeping up with the current job landscape is no picnic either. Study.com is hoping to help you with both by offering a more affordable option to advance your education, and a work-at-home opportunity for those who need it. Please note, I am not a member or an affiliate for Study.com. This review has been researched with information and testimonials that are available online in the public domain. Any conclusions drawn by myself are opinions. Study.com is an online educational platform that helps students improve their grades, prepare for tests and even earn credits that can be transferred to thousands of colleges and universities. They also provide a work-at-home opportunity for experts in various fields ranging from Math, Science and Physics... to Business, Psychology, and History… among others. ​​​​Founded in 2002 and headquartered in Mountain View California, Study.com currently provides over 25,000 video lessons and 50,000 articles to 30 million students and teachers per month. Tutoring has become a popular work-at-home hustle. If you want to make extra money from home... maybe it's health issues, young children at home, or even economic hardship, you're looking for peace of mind. Either way, if earning an online income is what you want, then a simple step-by-by step strategy is what you need to get what you want. I'm going to give you a free step by step beginner's guide to making money online and you can get it by clicking HERE. You can also make money doing online surveys with companies like Survey Junkie which are a great way to put some quick cash in your pocket. Swagbucks is another way to make some money online by doing things you already do online like searching, watching videos and visiting websites. There seems to be some concern online about Study.com being a scam, but no… they are not. Study.com is 100% legit and whether you’re a student, teacher or a contract employee… they have legitimate products and services to offer. The complaint above is referring to a common bait & switch scam. 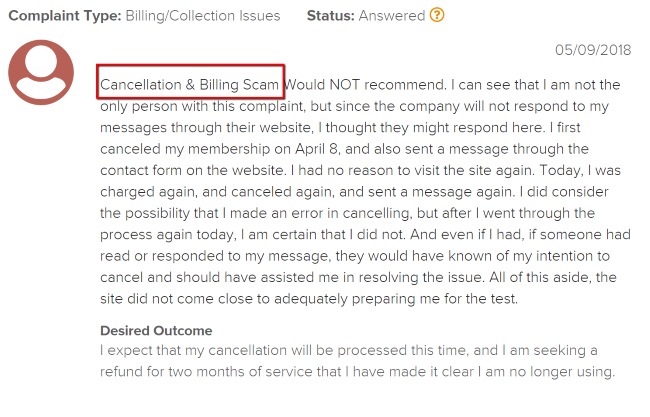 They hook you with a free trial, get your credit card information and when the trial is over, they make it difficult for you to cancel or get a refund. Meanwhile, they bill your credit card every month. This isn't uncommon. I moved a while ago and switched gyms, but it was like pulling teeth to cancel my old membership. A simple phone call should have been enough, but instead they had me jumping through hoops. There are companies out there that make money exclusively from this scam but the good news is Study.com is not one of them. For the complaint above… here is their response. So, Study.com did look after this customer, although I’m sure the customer didn't appreciate having to write to the BBB before getting a response. There are similar platforms using this bait & switch scam, some intentional and some not. One way to avoid the hassle is by signing up with your mobile device. When you join using the Google or Apple app stores, your payment is not going to Study.com directly. Another issue that’s come up is the selling of your personal information. That doesn’t qualify them as a scam either, but it’s important to know. Study.com is either owned or partnered with a company called Remilon LLC, who at one time operated the website educationportal.com. I’m not sure when they came together (or if they were always the same company), but both remilon.com and educationportal.com now redirect to Study.com. 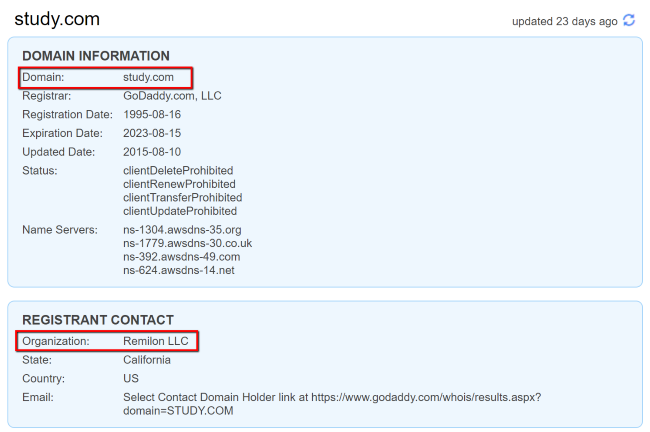 And… the Study.com domain is currently registered by Remilon LLC. Not that ownership matters, but it does provide us with a deeper look into any issues Study.com may have. As I looked into Remilon I noticed an employee saying they were selling student information to for-profit colleges. There’s no way to verify that Study.com is selling your personal information… but, as we’ve learned with the Facebook hearings recently, it’s fair to assume that someone is selling it without your consent. I also found it strange when I was going through the Study.com registration that they were asking for my phone number. Why do they need your phone number? Advertising and marketing has definitely become hyper-targeted over the last few years… and this is a direct result of our contact information, interests and online habits being sold to agencies and private businesses. But again… that doesn’t make Study.com a scam. Also, to be clear… I’ve only focused on the negatives so far... There are a lot of positive reviews as well which I’ll talk about in a moment. You may be signing up as a student or applying as a work-at-home contractor, so I’ll talk about both. I must admit, I was annoyed by the sign-up process. They don’t give you the plans and pricing up front. Making your way to the payment page is like a choose your own adventure, picking various options from drop down menus. You first option is to indicate whether you are a student or a teacher. Once you’ve given them your name, email and your phone number (for what I don't know)… you’ll finally arrive on the page you're looking for. The one that tells you how much it's going to cost. A 5-day free trial is offered followed by a $39.99/month membership for students, and $59.99/month for teachers. This gives you unlimited access to Study.com’s entire library of courses and resources. Depending on your specific needs, those prices may be ridiculous, or they may be a bargain. 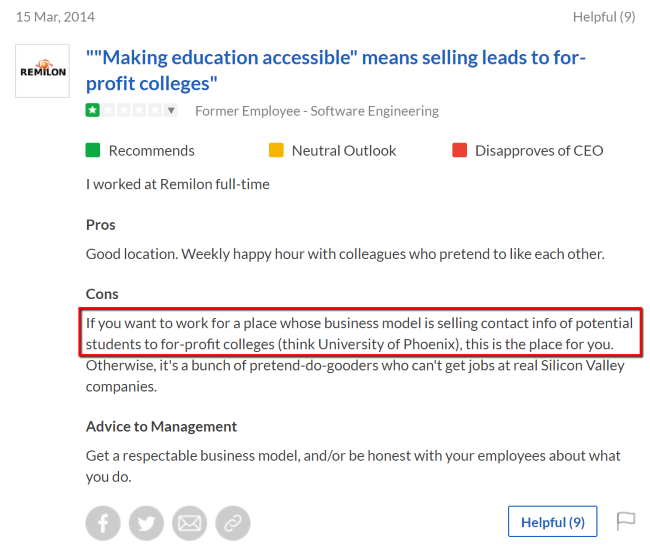 Unlike platforms like Wyzant, Skillshare or StudySoup… getting hired by Study.com is a more traditional process. They list specific job descriptions for positions such as Accounting, Mechanical Engineering or Finance for example, and you’ll have to apply by filling out an application and submitting your credentials. Your application will also be job specific. You will also be asked about your highest level of education. If you’re not able to get hired on by Study.com, there are other options to making money online. Here’s another area where it was difficult to track down accurate information. Local in-house employees report salaries that range from 50K/year to 100K/year and higher. However… work at home contractors are paid on a per-task or per-project basis and make significantly less. Most of the contractor reviews complained about the low pay which seems to be in the minimum wage range. One problem is that even when a project pays well, your work must be approved by reviewers who are not always consistent. If your project is not approved, you won’t be paid. So, you’ll need to average your overall time to include work you have been paid for, and work you haven’t been paid for. Your rate will also depend on how fast you can complete a project. If something requires more research than expected, a simple task like answering a question might take awhile. The best way to make money online though is to not depend on one source. You can combine jobs like Study.com with other strategies. Surveys with companies like Survey Junkie and Swagbucks for example and even building an online business. Approved payments are made twice per month via PayPal. Those positions can be broken down into their respective fields of study. The biggest complaints from customers were those related to billing and refunds as mentioned earlier. Pricing was also an issue for some, as well as some technical problems with the app. Inconsistent reviewers and not having their work approved. There are also many positive Study.com reviews. Although some students complain about the price, others say they are taking courses that would cost thousands in college. I as I mentioned a moment ago... for the right person, Study.com could be bargain. Opportunity to advance their own education through teaching. 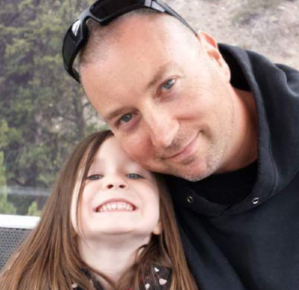 Working from home, having more time with family and not dealing with a daily commute. As a work-at-home opportunity (that is what this site is all about after all) 🙂 Study.com can be an additional stream of income. 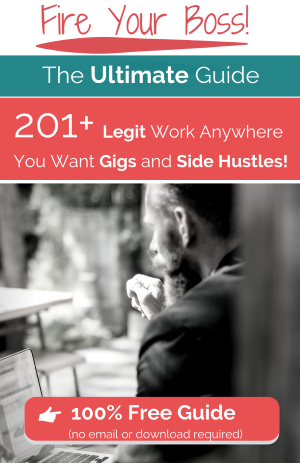 I wouldn’t recommend it as your only income, but full-time freelancers can certainly leverage Study.com with other freelance gigs and side hustles. I also like that I didn’t see any complaints from independent contractors not getting paid on time. When it comes to remote jobs, low pay is often expected... although the limited income can often be justified by fewer expenses such as commuting costs, meals etc. Having said that... it would be nice if Study.com was more transparent about earnings or had a proper pay schedule. It's hard to aim for a target that doesn't exist. The other issue with jobs like these is that there is no passive income potential. Your biggest advantage working online is being able to create something once, automate the process and make money repeatedly from that single effort. That’s not possible when you’re getting paid on a per-task or hourly basis. Whether you’re a student, a remote worker looking for an at-home job… or both, Study.com is worth your consideration. The price may be a little steep for customers who can’t take full advantage of what they're offering… but for the right person I see no reason not to give them a shot. As far as the work-at-home opportunity, the biggest challenge is the low pay. Every extra dollar can make a big difference though, especially when it's a dollar here, and a dollar there when you combine it with other money-making strategies like Survey Junkie, Swagbucks or my top recommended strategy. Since a lot of people struggle with things like health issues, being home with children, or difficulty finding work... Study.com can be a huge help, although it may not solve your money worries completely. Peace of mind is probably what you want and creating "passive" income online is the best way to get what you want. I hope my review has been helpful and if you have any comments, questions, or experience with Study.com… please share in the comments section below. study.com publish inaccurate courses. I notice them that their java codes are full of syntax errors. never got any respond. One of the worst experiences. I would not recommend this company, in fact I would strongly discourage anyone (and have) from using this as a resource. The billing is a huge SCAM!!! Fraudulent charges have been made to my credit card account for 6+ months. I signed up for the trial period and cancelled immediately after watching one of their videos. The video itself was actually really great, but I cancelled because I felt I could get the same information elsewhere on the internet for free. I received a confirmation email stating that I did in fact cancel, that was in May 2018. I am currently still being charged the $39.99 membership fee. It has been a nightmare trying to get a straight answer or even get someone on the phone to help. The last email I received (1/18/19) confirmed for the fourth time that my account has been cancelled; I still have not seen a dime and THEY CHARGED ME AGAIN THIS MONTH!!!!!! I have recently filed a complaint directly with my bank and hopefully they will have more luck resolving this matter. With there being so many educational websites/resources online (many of which are even FREE! ), it is not worth the trouble. Hi Melissa, Wow… so sorry you’re going through that. Hopefully your bank is able to resolve that. I can’t speak directly to your experience but hopefully if others are having similar issues they can share their insight as well. Thank you for taking the time to comment. Hello. How many days did they process your refund? It was last November 30 when I signed up and I thought it was for free. When I e-mailed them, they immediately respond that they will process a one-time-refund. But its been 7 days. Hi Genny, there may other readers who can respond to your request. When researching refunds seemed to be the most common complaint but I personally haven’t gone through the refund process so my apologies I can’t be of more help. What a pain in the b…, I can’t login in my account,and Study.com is charging me for the past 3 months. I called 100 times and they are not helping me in anything. They said “I will call you back” never call me.